The alluvial lowlands of the Tigris and Euphrates rivers in southern Mesopotamia are widely known as the "cradle of civilization," owing to the scale of the processes of urbanization that took place in the area by the second half of the fourth millennium BCE. 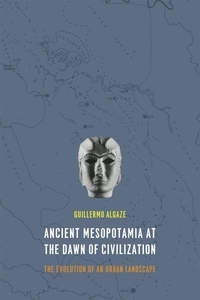 In Ancient Mesopotamia at the Dawn of Civilization, Guillermo Algaze draws on the work of modern economic geographers to explore how the unique river-based ecology and geography of the Tigris-Euphrates alluvium affected the development of urban civilization in southern Mesopotamia. He argues that these natural conditions granted southern polities significant competitive advantages over their landlocked rivals elsewhere in Southwest Asia, most importantly the ability to easily transport commodities. In due course, this resulted in increased trade and economic activity and higher population densities in the south than were possible elsewhere. As southern polities grew in scale and complexity throughout the fourth millennium, revolutionary new forms of labor organization and record keeping were created, and it is these socially created innovations, Algaze argues, that ultimately account for why fully developed city-states emerged earlier in southern Mesopotamia than elsewhere in Southwest Asia or the world.